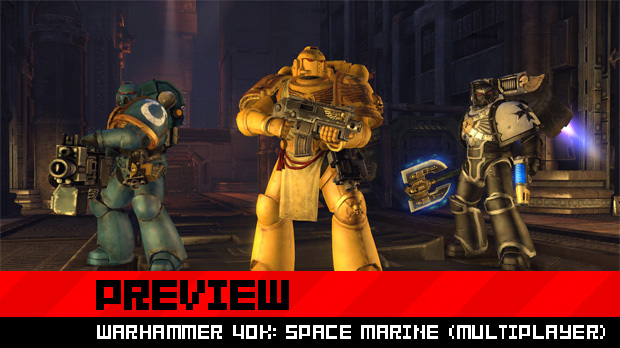 Last week, I was a press event in Santa Monica to check out Relic Entertainment's new third-person shooter, Warhammer 40,000: Space Marine. I have been a huge fan of the lore of the Warhammer 40,000 setting and even spent a few years painting figurines from the game as a hobby. 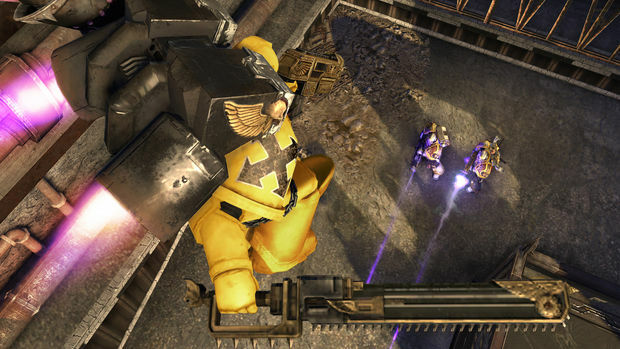 But while I love the trappings, the miniatures game was always a bit convoluted for my tastes, so I've been looking forward the idea of having direct control over a Space Marine for a long time. They are exactly what they look like: Hulking masses of carnage. We were to pit them head-to-head, the forces of the Emperor's Imperium against their brothers corrupted by the forces of Chaos. And the result was brutal. 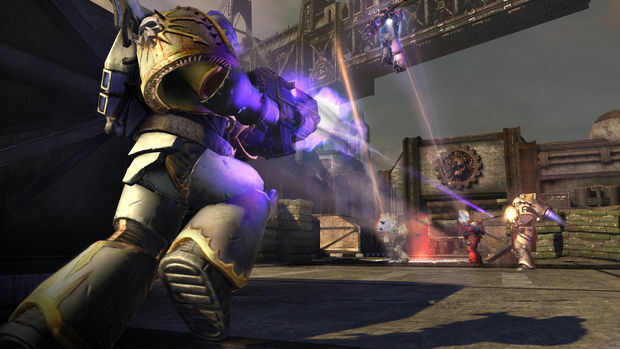 The competitive multiplayer offerings in Space Marine consist of 8 vs. 8 team battles in two modes, a deathmatch game called "Annihilation" and the control point-based "Seize Ground." 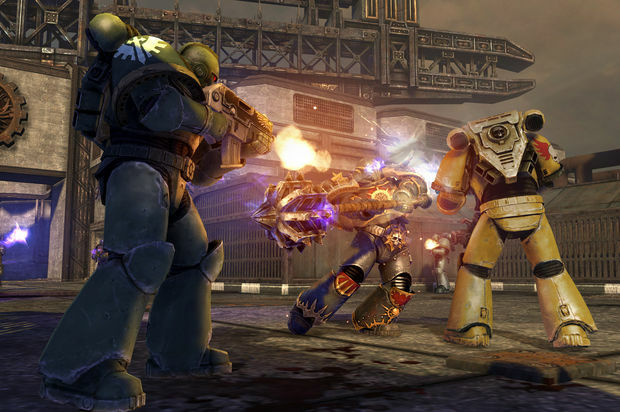 There isn't really a whole lot that distinguishes them from their counterparts in other multiplayer games in terms of rules, but the game does strike a nice balance in its three classes of Space Marines. The Tactical class is your all-rounder, proficient but not exceptional at anything. Devastators carry the big guns, your Heavy Bolters and Plasma Cannons, and do so with tremendous effort as they trudge around the battlefield. Assault Marines fly around on jetpacks and swing Chainswords. Yes, that's a combination chainsaw and sword. You can guess what everybody quickly gravitated towards. The Assault class is stupidly fun. While they have these jetpacks on their backs, they are still covered in bulky armor and drop like a ton of bricks once the brief burst of upward mobility ends. If you're quick, you can even target an enemy on the ground to receive your weight in damage but landing near a target is usually enough as their melee weapons cut through opponents like butter. Once we saw the clear preference for getting up close and personal, a few of us got smart and switched to the Devastator class. Their Plasma Cannons fire a ball of energy that explodes on impact for a ton of damage. Using one player as a lure, oncoming melee fighters would be pelted with plasma, often resulting in multiple kills of overeager Marines. It all worked so well until the enemy got a sniper on the field, who would later be flanked by Tactical units. The balance is there and it's fun. The feeling of weight does wear thin after a bit however, and I was constantly trudging back to the battlefield to get back in the action. In Seize Ground games, you can choose to spawn at a control point held by your team. But doing that adds a significant delay added to your respawn time almost making it pointless unless you absolutely need to make it to the entire opposite end of the map to hold the point you're spawning at. The three maps we were shown were interesting and more vertical than I would have expected considering how slowly everyone moves. It makes the Assault class all the more appealing and all the stages had plenty of available space for them to rocket off into the air. A ruined bridge stage was particularly neat, with some great choke points at the center and a set of sub-surface paths. They're perfect for 16-player matches with a fair bit of ground to cover without becoming too expansive but, again, the speed of the characters does make finding that action something of a chore on occasion. We were also given the opportunity to tool around with the Customizer which allows you to create the Space Marine you've always wanted. Speaking as a fan of the models, it's a loving nod to the hobbyists who have kept this franchise alive for 25 years. 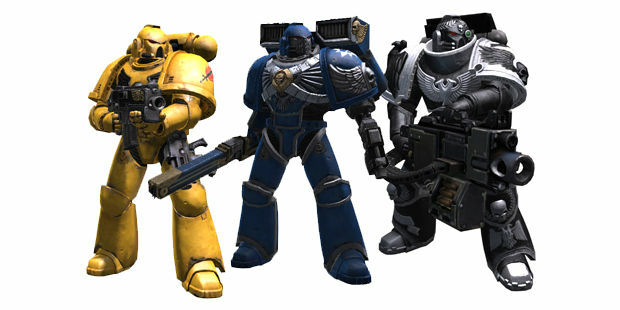 More than thirty chapters of Space Marines are represented as base color sets but you're free to make your unique Marine by swapping out helmets, chests and individual arms and legs. Each component can be painted individually from an impressive range of official colors from Games Workshop's Citadel line of paints and battle details can be switched on or off, allowing you to look like a battle-worn soldier or the crisp, clean fist of the Emperor. The Customizer also allows you to create custom loadouts. Each class has its own selection of weapons they can wield, along with a range of class and weapon-specific perks. There is plenty of variety among the perks, of which you can select two. Weapons and perks are unlocked through an experience progression system with over forty levels. I was thoroughly impressed with the customization options. Failing to provide enough choice for fans of 40k would have been met with torches and pitchforks, most likely. But Relic has hit the mark wonderfully here and making a Space Marine with the Customizer brings a little touch of the creativity inherent in the title's forebears. I had a lot of fun playing Space Marine in multiplayer. The battles are intense and the three classes provide for heated and strategic conflicts which should make for a solid addition to the title when it releases this coming September.